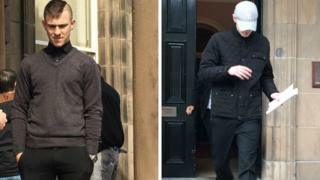 Two men who killed a family's two pet geckos have been warned they could face custodial sentences. Daniel Innes, 20, and Jordan McIsaac, 18, put one of the lizards in a kitchen blender. The pair filmed the act in Aberchirder, in Aberdeenshire, in March last year. They were originally told they could avoid jail if they showed true remorse, but a sheriff at Banff Sheriff Court has now remanded them in custody ahead of sentencing in a fortnight. At a previous hearing in July, Sheriff Philip Mann told Innes and McIsaac in July that their crime was "chillingly evil" and a "matter of great concern" as he deferred sentence for three months. When the pair appeared before him again on Tuesday, Sheriff Mann told them that he was in a "difficult position" after hearing accounts of their actions over the last three months. He stressed that he had initially deferred the case against them to give them the chance to demonstrate that a non-custodial sentence might be appropriate. He added: "For that to work it really would need 100% commitment and I'm not satisfied that you have shown that 100% commitment." The court heard that both men had donated money to the Scottish SPCA animal charity. The sheriff remanded them and warned that a custodial sentence could be likely when they returned for sentencing on 31 October. The court previously heard Innes and McIsaac used a phone belonging to the householder's teenage son to film the crime as he slept. His mother, Amanda Bibby, returned home early from a weekend break to find her pets dead, with Innes also causing thousands of pounds worth of damage to her home.